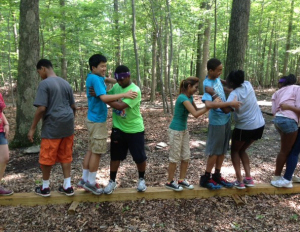 The team at FLOC’s Outdoor Education Center are no strangers to facilitating team building activities for groups of young people and adults. Often these activities are conducted on site at the OEC, but on this particular day, we took the show on the road. Early, on a warm and muggy Wednesday morning in August, the OEC staff met at a patch of little used lawn on Shepherd University’s campus, equipped with a van full of “toys” to be set-up in preparation for almost 100 freshmen students to come and play with. This program was part of an optional extra- orientation program that these students signed up for which allows them to settle in early, get acquainted with some new faces, and not have to feel so overwhelmed when the masses of under and upper class students arrive not more than a week later. 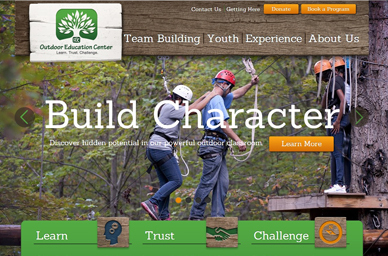 The students were already placed into teams with designated enthusiastic leaders and their own colors. The playful activities lined up for them are about having fun in a group setting, but they are, of course, also about a lot more. Seven stations were set-up and all with a couple different initiatives. These initiatives are games with a purpose, typically presenting their participants with a challenge or problem to be solved. These challenges are presented or framed with contextual stories that the students find relevant and relatable. The whole thing starts with a big group game, in this case a variation of Rock-Paper-Scissors, just for fun and to break the ice. Then the teams spread out to their stations and start the rotation. Many of the challenges and problems get completed or figured out. We as facilitators then make it a point to ask good questions. “How did you work as a team?” “Did everyone feel included?” “How did you make decisions?” “What was difficult about communicating together and what could you have done differently?” “Were there any leaders that emerged during that activity?” This is where the real learning takes place and the students can begin to reflect on how they can apply some of what just happened to their understanding of who they are and apply it to their upcoming first year of post-secondary education away from home. The morning then finished with an active scavenger hunt around the campus and Shepherdstown proper. This continued experience of camaraderie got the students out and about, getting familiar with all the great shops and local businesses that Shepherdstown has to offer them. Good luck to them and all the other first-year post-secondary students out there.